Its official. 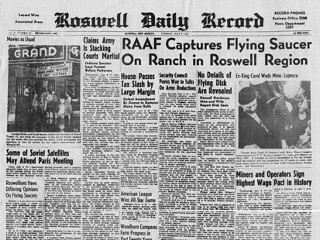 The FBI has released documented evidence of UFOs over Roswell New Mexico. Feel free to visit the FBI vault and view the report for yourself. The text describes UFOs, "circular in shape with raised centers, approximately, 50 ft in diameter. Each one occupied by three bodies of human shape but only three feet tall, dressed in metallic cloth of very fine texture. Each body was bandaged in a similar manner to the blackout suits used by high speed flyers and test pilots." Arcturi.com finds it quite remarkable that the FBI has posted this story to their vault. It is perhaps the largest piece of evidence to date that could be seen as a "disclosure." We will keep you posted on any futher development. Many of the Arcturi readers (as well as the author of this material) know that aliens exists. We feel that an event is coming in perhaps the near future that will confirm this for the rest of the world. It seems the public is being fed baby food that will eventually lead up to the main course. However, we are excited that the government is finally releasing these files and will continue in this direction.